The success of the motorcar in the early 1900s can be attributed to a handful of visionaries who steadfastly pursued the automobile’s development after the turn of the century. Paramount among them was Henry Martyn Leland head of the long established firm of Leland, Faulconer, and Norton. In 1901 the company was contracted to produce engines for Lansing, Mich., automaker Ransom Eli Olds. Leland supplied 2,000 single-cylinder engines for the new curved-dash Oldsmobile, America’s first mass-produced automobile. After his design for an improved engine was rejected Leland joined the Henry Ford Company at the behest of investors William Murphy and Lemuel W. Bowen, who had grown disenchanted with Ford. With Henry Ford forced to resign in 1901, the Ford Motor Company was reorganized as the Cadillac Automobile Company in August of 1902, a name chosen in honor of Antoine de la Mothe Cadillac, the French colonial governor in North America who established the city of Detroit in 1701. Rare among even V16 Cadillacs, this 1933 Convertible Sedan was designed and built by Fleetwood and incorporates an integral trunk, one of the first of its kind on an American car. The Fleetwood brochure stated, “Fleetwood designers are constantly in touch with prevalent and advanced European and American styling so that the most modern may be interpreted into their exquisite creations.” All 1933 V16 models featured new flowing bodylines in contrast to the squared contours of the 1930-1932 coachwork. Leland was to supply engines built to his new design (the same basic one rejected by Olds), as well as transmissions and steering gears for the new Detroit-built Cadillacs. In turn he was granted a small block of stock and appointed company director. With Leland running the show the first automobile to wear the Cadillac emblem rolled out of the factory on October 17, 1902. It was a mechanical masterpiece, a precision work of engineering built to unprecedented tolerances. Leland had perfected his inclination for thousandths-of-an-inch accuracy working in the late 19th century firearms industry. He had started as a machinist with the Colt’s Fire Arms Manufacturing Company in Hartford, Conn. It was there that he honed his skills for the mass production of interchangeable parts, and learned assembly line manufacturing. Cadillac became the best built automobile in America, and in 1908 the company was awarded the coveted British Dewar Trophy for engineering excellence. To achieve this distinction, three Model K Cadillacs were torn completely down, their parts mixed, and the cars reassembled under the scrutiny of the Royal Automobile Club of Great Britain. Not only did the trio of Cadillacs go back together without any filing or hand-fitting, they were immediately sent off on a 500-mile endurance run at the Brooklands track where they ran at full throttle without a single mechanical failure! For an automobile in 1908, this was almost without precedent. Cadillac had earned the right to call itself the standard of the world. By 1910, Cadillac was considered one of the most prestigious automobiles in America and had become a division of Billy Durant’s emerging General Motors combine along with Buick, Oakland (later to become Pontiac), and Oldsmobile. Roadsters and Phaetons were less prolific in the Cadillac V16 model line. Only about one-fifth of the cars produced from 1930 to 1937 were open, two-thirds were five or seven passenger Sedans or Imperials, the rest Coupes or Town Cars. Cadillac only produced 85 Sport Phaetons. In 1917, following an argument with pacifist Durant over building Liberty aircraft engines for the war effort, Leland and his son Wilfred resigned their positions with Cadillac and established their own company under the name of Lincoln, the first American President for whom the elder Leland had voted. Henry and Wilfred built their aircraft engines, and after the war the Lincoln Motor Company began producing luxury cars in direct competition with Cadillac. There was, in that respect, a great similarity between Leland in America and Wilhelm Maybach in Germany. Maybach and his son had been forced from Daimler in the early 1900s and after The Great War had also begun manufacturing cars to compete with those produced by their former employers. For the Lelands it was building luxury Lincolns to market against Cadillac, and for the Maybachs it was a marque bearing the family name which began the battle for market share against Mercedes. Both families, father and son, sought to build a better car in revenge. The Maybachs were successful, the Lelands were not. By 1922 Lincoln had been acquired by Ford Motor Company. Surely there must have been a sense of retribution in purchasing Lincoln from the man who had been the instrument of Ford’s dismissal from the first company bearing his name. 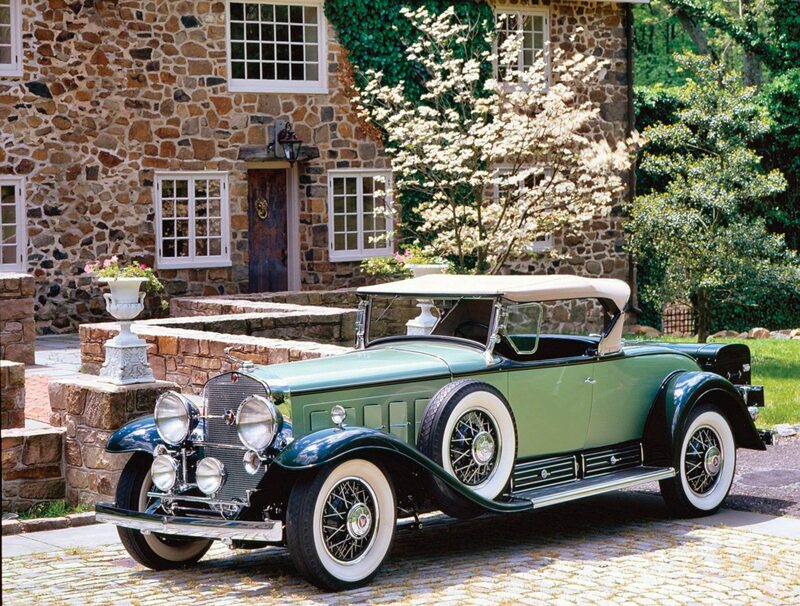 This 1930 Sport Phaeton was among five cars selected by Cadillac to tour Europe in 1930. The handsome styling of the Sport Phaeton was evident from every angle,even from the rear with the top up, about the worst possible view of any car, yet the style 4260 V16 managed to carry it off with uncharacteristic savoir-faire. With or without the Lelands, under General Motors Cadillac prospered as one of America’s preeminent marques. The GM luxury car division had only one ambition, to produce the finest automobiles in the world and as the crown jewel of General Motors, Cadillac was free to pursue that goal knowing it had the financial might of what was then the largest and most powerful company in the United States. The eight cylinder engine was the most reliable and popular luxury car engine in America by the mid 1920s, and Cadillac had pioneered it in 1915. Packard had upped the stakes in the luxury car market with the introduction of a V12 (Twin Six) model line that same year, the first twelve-cylinder automobile put into series production anywhere in the world. At the time of its introduction, on May 1, the Twin-Six virtually eclipsed Cadillac’s achievements with the V8. 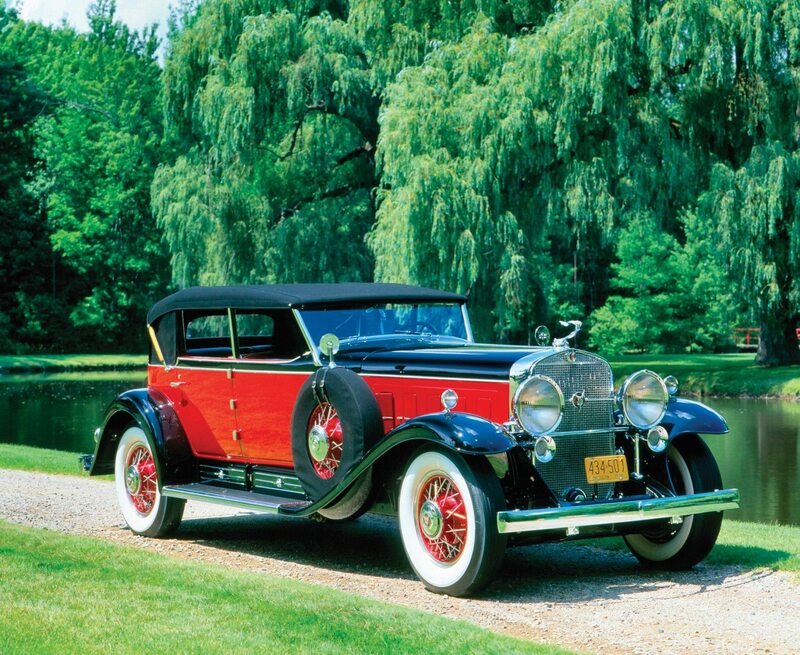 The stately twelve-cylinder Packards became the car of choice for film stars, industrialists, politicians, and heads of state. In 1921, President-Elect Warren G. Harding, the 29th occupant of the White House, rode down Pennsylvania Avenue in a Packard Twin-Six. This was the first time in history that an automobile had been prominently featured in an inaugural parade. It was a humbling blow to Cadillac and General Motors. The Twin-Six remained in production until 1923, the longest of any model up to that time, and accounted for a staggering total of 35,000 sales, establishing Packard as one of the world’s leading manufacturers of luxury automobiles. Unlike contemporary engine design of the 1930s, the Cadillac V16 had barely a trace of unsightly wiring; everything was either carefully routed or concealed. Spark plugs were located on the inboard side of the engine and their wires secreted beneath a styled cover in the cylinder valley. With East Grand discontinuing its twelve-cylinder models in 1923, the pressure was off GM but development continued in an effort to design an engine that would surpass the lauded Packard Twin Six. In 1927 Cadillac hired Owen Nacker away from Nordyke & Marmon in Indianapolis. He had been working on the design of a sixteen cylinder engine, which Marmon would introduce in 1931, but not before Cadillac tapped Nacker’s engineering skills to develop its own sixteen by 1929. The Cadillac V16 was basically two inline eights sharing a common crankshaft. The cylinder banks were placed at a very narrow 45 degree angle and each had its own independent fuel and exhaust system. The engine used overhead valves, a design not previously seen on a Cadillac, and hydraulic valve adjustment, an industry first, which contributed to the V16’s exceptionally smooth and near silent operation. With a 3 x 4 inch bore x stroke, displacement was 452 cubic inches, (thus the model designation 452), with an output conservatively rated at 165 horsepower, (later increased to 185 horsepower) and delivered through a three-speed transmission. 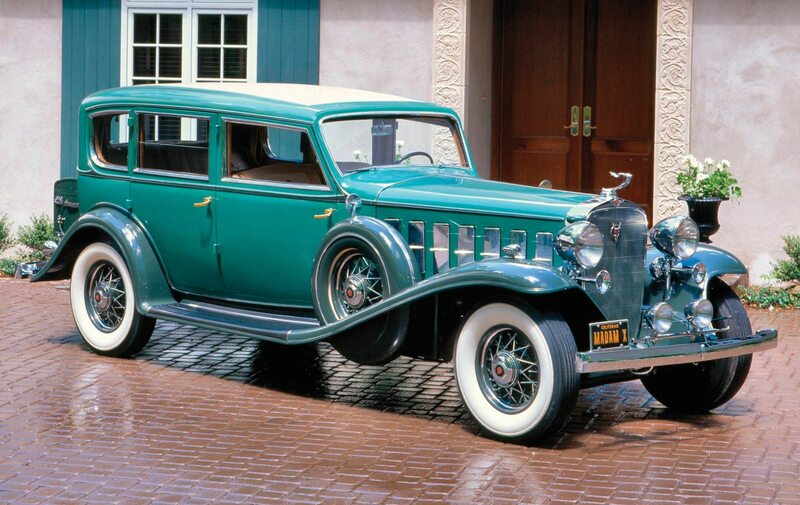 Built on the early 148-inch wheelbase chassis, this 1930 V16 Madam X Imperial Landau Sedan was displayed by Cadillac at the V16’s January 1930 Waldorf Astoria debut. It was the only V16 shown. It was one of the last cars to be bodied at Fleetwood’s Pennsylvania facility, which GM closed down in December 1930 after moving operations to Detroit. The Fleetwood, Pa., Madam X models are distinguished by their upright, split Vee windshields offered only until mid-1930. Later examples built in Detroit featured a one-piece slanted windshield. The body design was done by Harley Earl and featured a collapsing rear quarter. There is also a rear roof vent to allow fresh air into the passenger compartment without having to lower the windows. Delivered to Don Lee Cadillac in San Francisco, it was sold to Charles Howard, the regional Buick distributor and owner of the racehorse Seabiscuit. The car’s original price was $9,988. The very idea of an American automobile powered by a sixteen cylinder engine was almost pure fancy before 1929, when everything was being readied at Cadillac for the introduction of the most powerful automobile in America. Then the economic bubble burst. In one day, a record number of shares changed hands on Wall Street, the New York Stock Exchange went into free fall and listed equities lost $26 billion in value. The nation was about to plummet into the worst economic catastrophe of the 20th century, just as Cadillac announced the most powerful and expensive car in American automotive history. On January 4, 1930, the effects of the stock market crash hadn’t yet been realized. Most economists considered it a market adjustment, a severe one for certain, but no one had any idea how deep the economic deprivations would go or how long they would last. At the fashionable Waldorf Astoria Hotel the annual New York Automobile Show opened and Cadillac formally introduced the all-new V16 model. 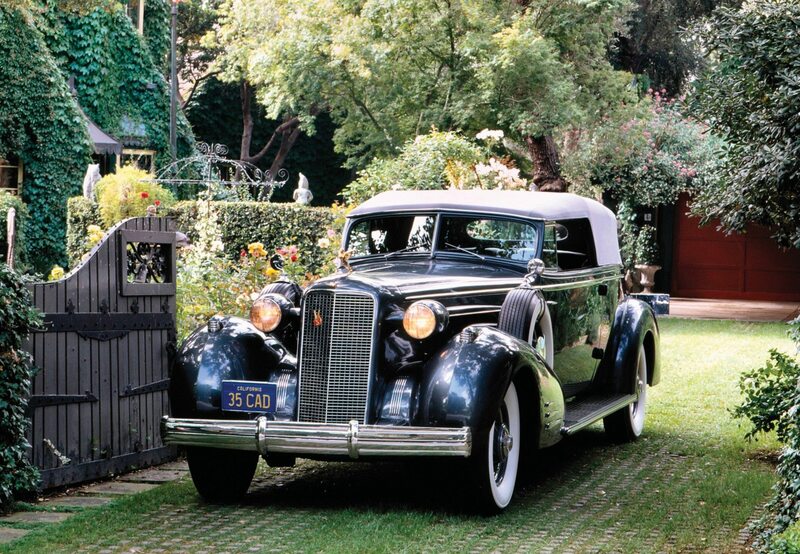 Built on the V16s 149-inch wheelbase, this elegant Town Car was done for film star Joan Crawford. The cars measures nearly 19-feet in overall length and is fitted with the accessory rear-mounted steamer-type trunk. New for 1933 were handsome spinner-type wheel covers and a completely restyled Cadillac Goddess hood ornament exclusive to the V16 line. The car unveiled was an Imperial Landaulette, known as the Madam X. 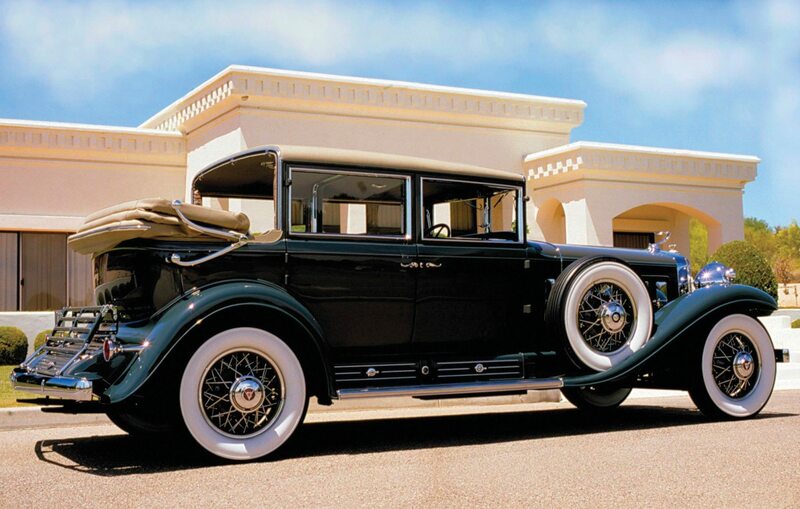 The custom coachwork was designed by Harley Earl and the body handcrafted by Fleetwood. According to Cadillac historian Maurice Hendry, Earl had been working on the body design when he attended a theatrical version of the 1920’s film Madame X at the Old Fisher Theater in Detroit. Earl was so taken with the mystique of the name that he persuaded Cadillac President Lawrence P. Fisher to use it for the debut V16 model. Fisher agreed but dropped the “e” at the end of Madame, which was the French spelling. An odd decision since the company was named after a Frenchmen! The Madam X was the last statement in Cadillac. The character of the Madam X was its swept back windshield, narrow pillars, and lower roofline. The cars were further distinguished from other V16s with chrome-trimmed windows, stainless steel moldings in place of paint stripes, or body panels inlaid with German silver striping. With these distinctive exterior features and custom designed interiors by Fleetwood stylists, Madam X models commanded a $1,000 premium over other body styles. 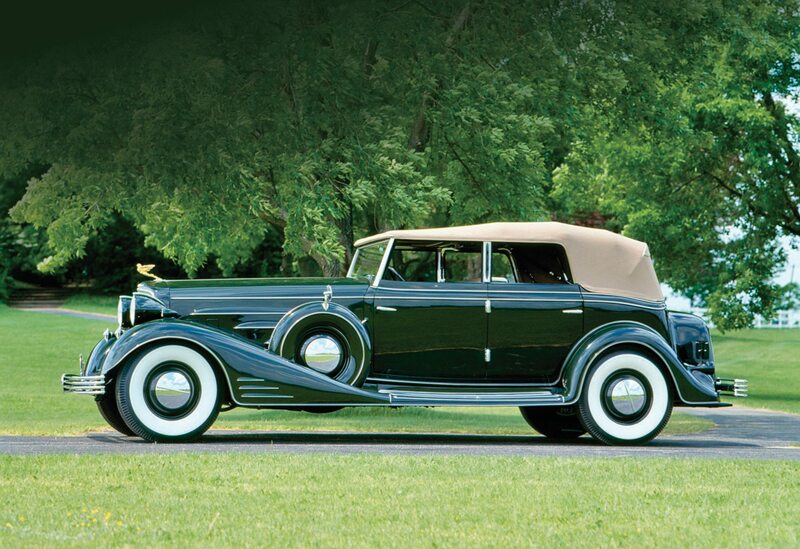 Fitted with some of the most exquisite coachwork of the 1930s, Fleetwood alone offered 54 body styles for the V16 chassis ranging from elegant Convertible Victorias and formal Town Cars to the dashing Sport Phaeton and Roadster. 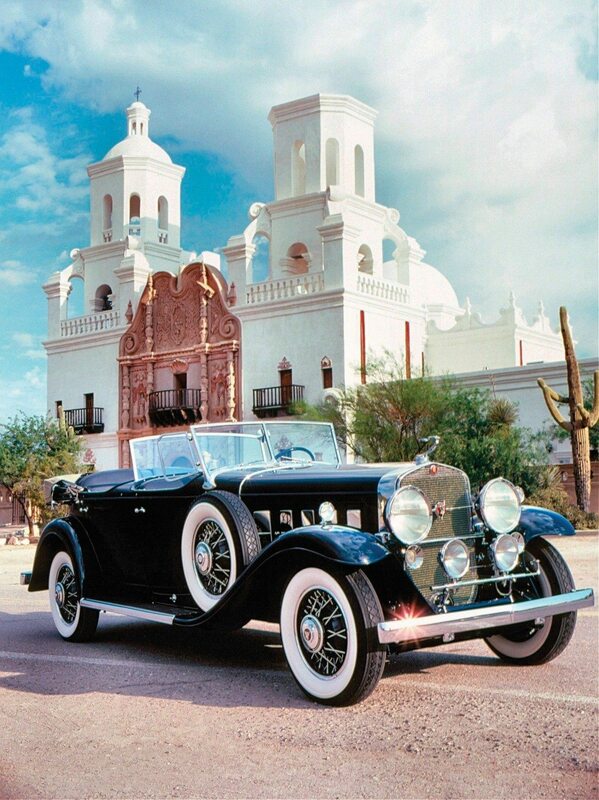 One of the first people to order the luxurious new Cadillac was legendary film director Cecil B. DeMille. 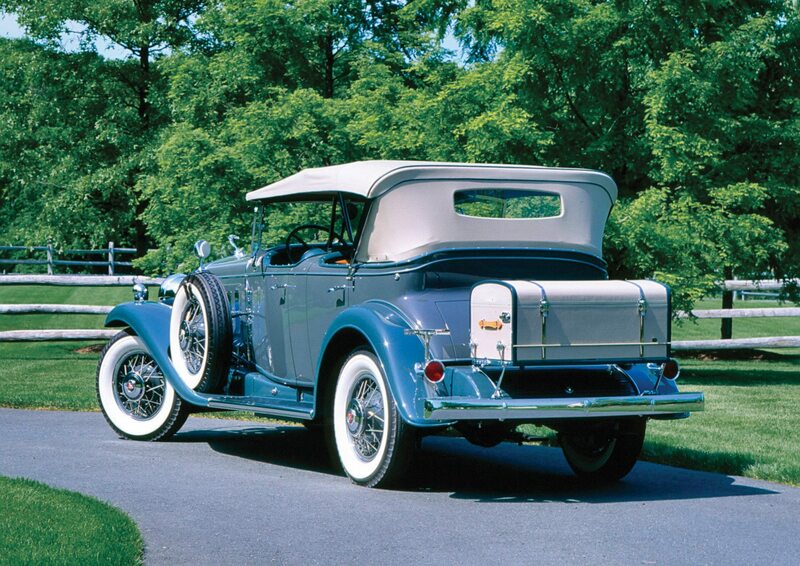 His beautiful Fleetwood Transformable Town Cabriolet was to become one of the film director’s favorite cars. A true automotive aesthete, he not only enjoyed being chauffeured around town in the stately Cadillac, he also liked to slip behind the wheel on occasion and drive the car himself. 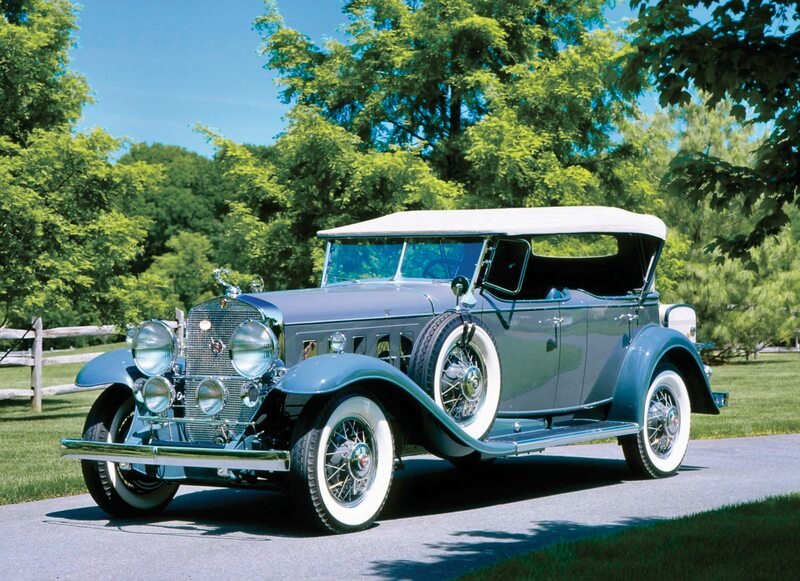 The majority of Cadillac V16s were closed cars like DeMille’s, about four out of every five produced, however, open cars like the Fleetwood-bodied model 4260 Dual Windshield Sport Phaeton, have become the most prized of the sixteen-cylinder models. Built on a 148-inch wheelbase chassis, a total of just 85 Dual Windshield Sport Phaetons were produced. With a catalogued price of $6,500, it was right in the middle of the V16 line. 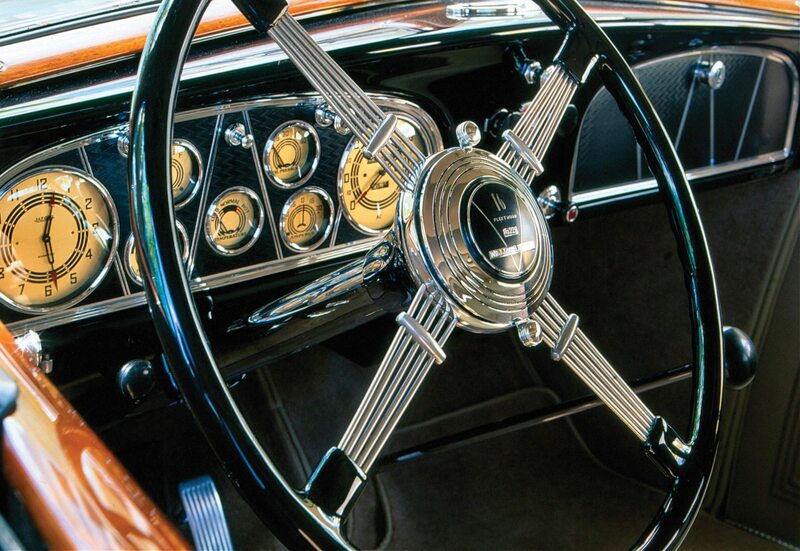 The dazzling Fleetwood design featured a roll-up rear divider windshield and elegant burled and ebony wood instrument fascia built into the front seatback, which provided rear occupants with both a speedometer and a Jaeger chronometer. Up front, there was comfortable seating for two and an ornate instrument panel with gauges surrounded in an elaborate crosshatch pattern steel fascia, flanked by a polished, damascened dashboard. Although Duesenbergs and Packards were decidedly flashier cars, many Hollywood celebrities once again began to choose Cadillacs for their personal vehicles. The movie studios were doing well during the Depression and the stars of the cinema had an image to uphold regardless of the economic tide. Back in the Hollywood of the 1930s, which was also the Golden Age of the automobile, stardom and glamour weren’t taken lightly, it was a lifestyle, enhanced at times by the studio moguls to ensure that their stars lived up to the public’s image of them, a far cry from today’s Hollywood. Driving, or being driven in the right car was very much a part of the Hollywood image. Screen star Robert Montgomery was often seen along the Sunset Strip behind the wheel of his V16 Cadillac Fleetwood Convertible Victoria, while actress Joan Crawford preferred to be chauffeured about in a stately Fleetwood-bodied V16 Town Car, or Transformable Town Cabriolet as cataloged by Fleetwood. 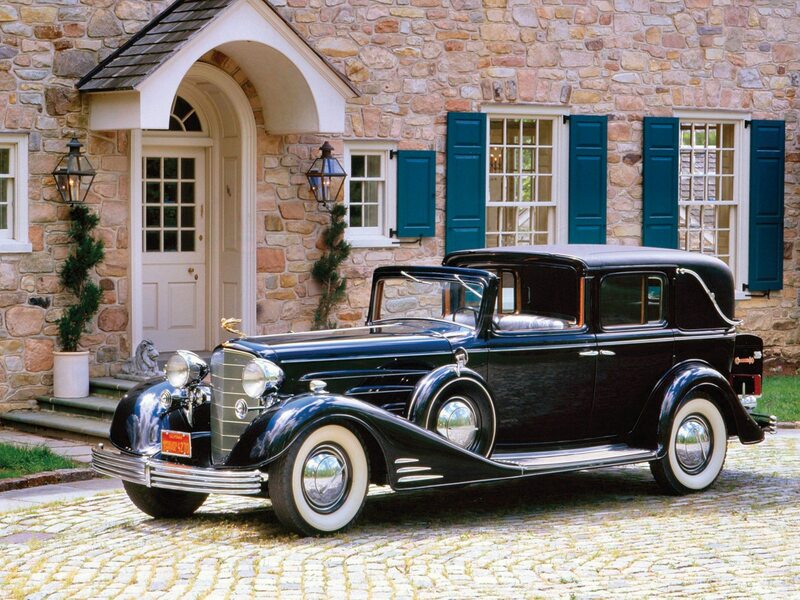 This was by far the most elegant Cadillac model of the 1930s, with the possible exception of the exquisite razor-edged Panel Brougham Town Car, of which Fleetwood produced only 10 examples at the astronomical price of $9,200 apiece. The Joan Crawford Town Car was a one-off design built to order in 1933. The spacious rear compartment was fitted throughout with specially cast pewter door handles and accessories, which is said to have been at Miss Crawford’s request because the actress did not want to see her reflection distorted by the traditional chrome finish on these items. The seat upholstery, door panels, and headliner for the rear compartment were done in complementary neutral grey broadcloth with matching grey wool carpeting similar to the DeMille car, whereas the chauffeur’s compartment was upholstered in black leather, and appointed with traditional chrome fittings. Roadsters have always been the sportiest models regardless of manufacturer, and Cadillac offered the most powerful, sporting two-seaters in America (by number of cylinders, but not as powerful as a Model J Duesenberg straight eight). The V16 Roadster with rumble seat, introduced in the Fleetwood Custom Line, was the most exciting and fastest of all 1930-1931 Cadillacs. This striking example is in the original two-tone green color combination and is a former Classic Car Club of America Senior car. 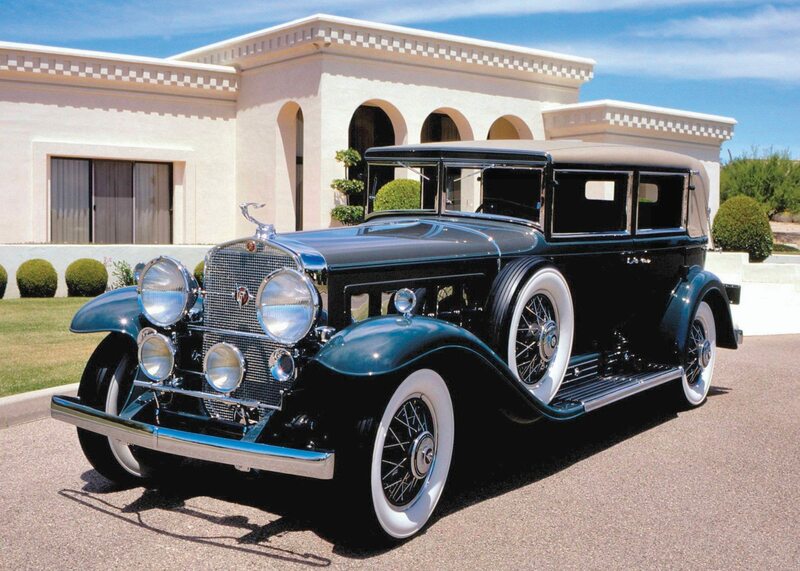 Earl restyled the entire Cadillac line for 1933. Gone were the rigid flat grille and rectangular bodylines of the earlier models. The new 452-C V16 Series featured more streamlined styling, with a vee-form grille and flowing, skirted front fenders accented by Earl’s addition of three horizontal chromed spears, the shape of which was repeated in the form of stylish ventilator openings along the length of the hood. 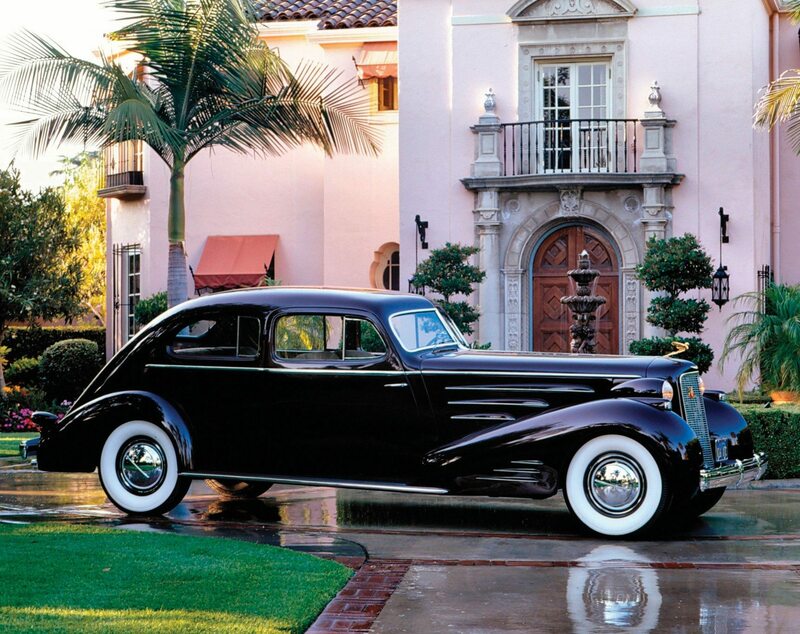 The hood vent design was one of the more obvious French influences shown in early 1930s Cadillac styling. For the V16, Fleetwood excelled with more than 65 different body styles from which to choose. However, in 1933 customers weren’t choosing that many. Sales were far less than expected. Cadillac had announced that only 400 cars would be built for the year to assure the exclusivity of the V16. It turned out to be a very optimistic figure. 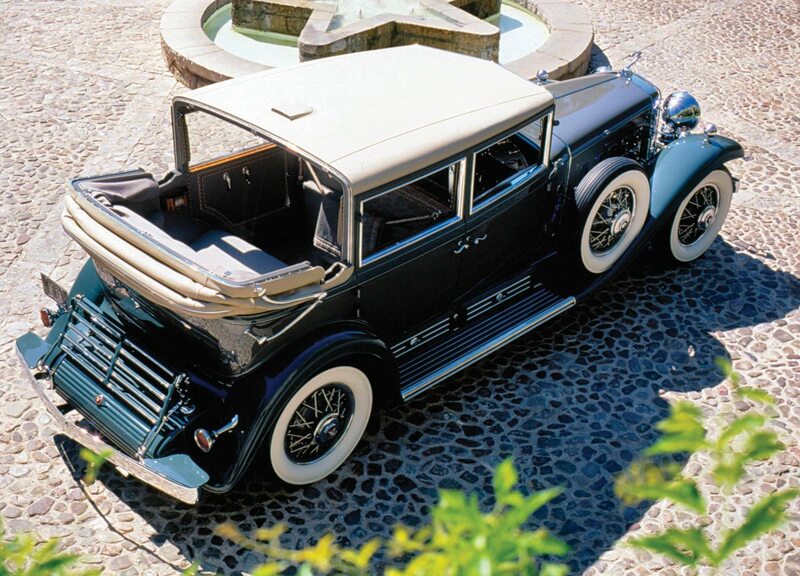 When Cadillac closed the books on the 1933 models only 126 sixteen cylinder cars had been delivered. While V16 body styles varied throughout the 1930s, the one constant in the model line was the mighty engine beneath every hood. In an era of economic fours, moderate sixes and boastful straight-eights, the public was still dazzled by the very notion of sixteen-cylinders, even if hardly anyone could afford to buy one. By the mid 1930s the V16 was becoming a loss leader for Cadillac. V16 dashboards and instruments were beautiful in appearance. The instrument and steering wheel are from a 1933 model and features a Jaeger clock to the left of the dashboard, and speedometer/odometer to the right. In the center are the fuel gauge (30 gal. max), ride regulator gauge, temperature, pressure, and amperage gauges. The steering wheel hub controls are for the throttle advance (top) and lighting (bottom). If an engine can be considered a thing of beauty then the Cadillac V16 was the most beautiful engine of the 1930s, not as flashy perhaps as the Model J Duesenberg’s bright apple green supercharged straight eight, but simply an elegant statement in basic black. The first automobile engine anywhere to bear the mark of a stylist, it was a striking combination of bright chrome, polished aluminum, and gleaming enamel. Unlike contemporary engine design of the 1930s, the Cadillac V16 had barely a trace of unsightly wiring; everything was either carefully routed or concealed. Spark plugs were located on the inboard side of the engine and their wires secreted beneath a styled cover in the cylinder valley. This sleek, green Madam X Sedan was a special order built for the President of General Motors of Canada. The stylish coachwork was accented with gold door handles and German Silver moldings. The stylishly shaped rear quarter windows accent the styling of this one-off Madam X sedan. The rakishly angled windshield and A-pillar designed by GM chief stylist Harley Earl were distinctive Madam X styling traits. Early cars were done with upright windshields and several others with sharply veed split windshields. All three variations were penned by Earl. In 1934 Cadillac began offering a streamlined Aero-Dynamic Coupe as a special order coachbuilt body for its V8, V12, and V16 chassis. The production models were almost identical to the 1933 Chicago Century of Progress Exposition show car. Fleetwood produced a total of 20 Aero-Dynamic Coupe bodies between 1934 and 1937, eight of which were for the V16 chassis. All of the production V16 models were mounted on Cadillac’s immense 154-inch (12.8-foot) wheelbase chassis; the longest ever used on a Cadillac production car, and sold for $8,100. The 1933 Century of Progress show car had been built atop the 149-inch wheelbase chassis used that year for sixteen-cylinder models. Despite their size (nearly 18 feet from bumper-to-bumper) the cars were easy to drive, with light steering and plenty of performance. The V16 ran almost silently and was capable of delivering an Aero-Dynamic Coupe to a top speed of 100mph. The car’s streamlined body would influence Cadillac and GM designs well into the 1940s. 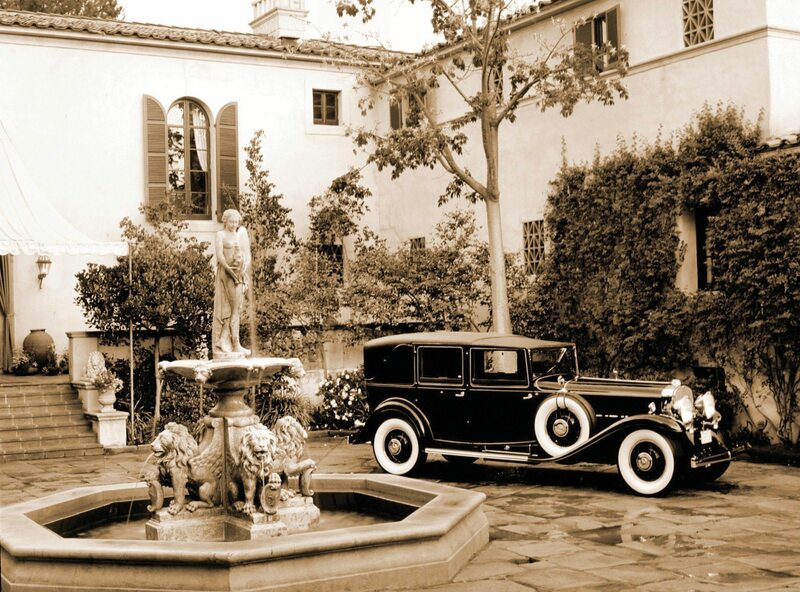 Film director Cecil B. DeMille placed one of the first orders for a V16 Cadillac in 1930. He requested a coachbuilt FleetwoodTransformable Cabriolet which cost the Hollywood mogul a cool $9,700, the second most expensive V16 built in 1930. The interior of the DeMille car was the basis for Joan Crawford’s 1933 Cadillac V16 Town Car. The DeMille car is now part of the Nethercutt Collection in Sylmar, Calif. Despite the economic tide that had swept prosperity from every corner of America, in 1930, 1931 and 1932, Cadillac had managed to sell a remarkable number of V16s. By 1933, however, sales of luxury automobiles began to decline as the Depression gained momentum and the financial community awaited the outcome of President-Elect Franklin Delano Roosevelt’s efforts to revive the economy. They were slow in coming and V16 sales were even slower. 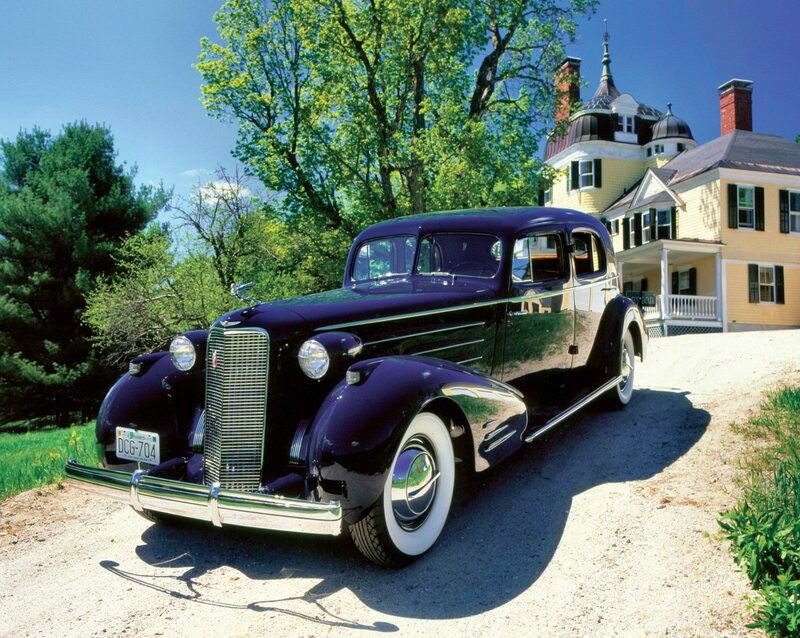 Averages fell to only 50 cars a year by the time Cadillac finally discontinued the high-end luxury model line in 1937. About 4,000 had been built since 1930. This, however, was not the end of the V16. Another of the elegant body styles offered for the V16 was the 5-Passenger Convertible Victoria. 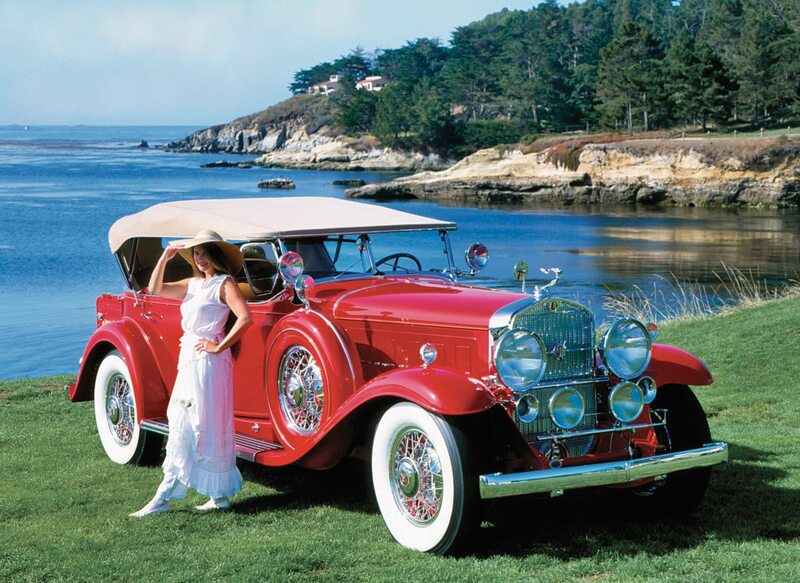 A European-inspired design the Convertible Victoria body style was also seen on Packard, Stutz, Duesenberg, and other high-dollar American cars of the 1930s. In 1935 this beautiful V16 sold for $8,150. The original owner was New York political and financial figure Grover Whalen. From 1928 to 1930 he was NewYork City Police Commissioner. He later served as the president of the 1939-1940 New York World’s Fair. The car is now owned by the Nethercutt Collection. To everyone’s surprise, Cadillac introduced a brand new V16 engine in 1938. The new 431 cubic inch sixteen was a flathead design and would remain in production until 1940. 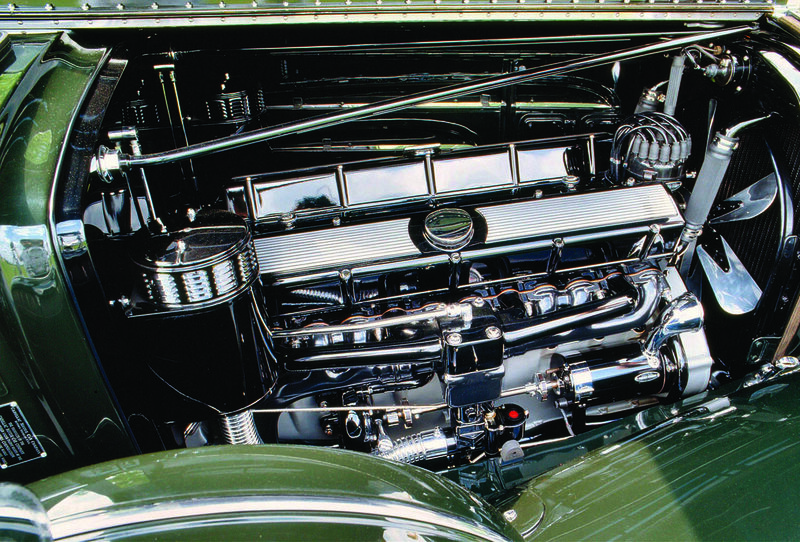 The second generation V16 used a smaller and lighter monoblock design based on Cadillac’s improved 1936 V8 engine, and developed the same 185-horsepower output as older V16s, from a 3-1/4 inch bore x stroke. Calling it a V16, however, was almost an abstraction of the term. With the twin banks of eight splayed at 135 degrees, the side valve, L-head sixteen was virtually flat, and so recessed within the engine bay that one had to peer over the tops of the fenders to even see the heads. Unlike its black enameled predecessor, the most dominant features of this engine were two protruding oil bath air cleaners perched atop the downdraft carburetors. 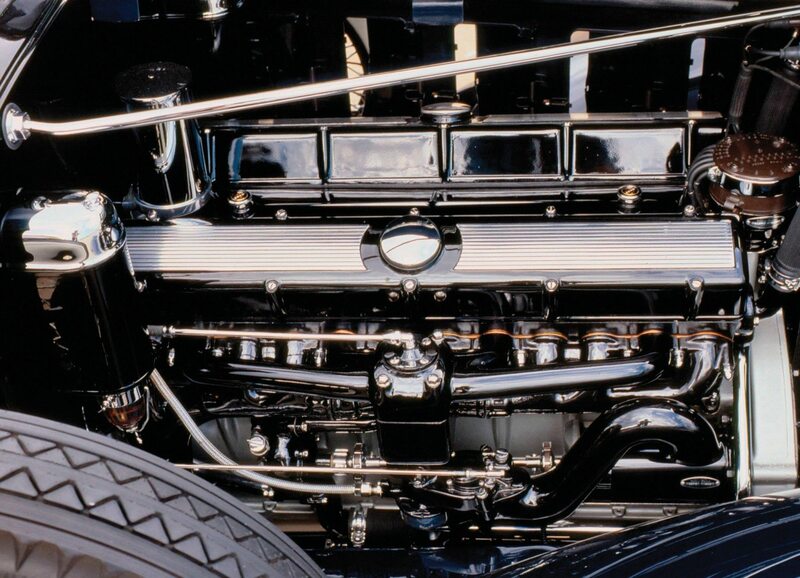 In comparison to the sculptured lines of the 1930-37 engines, this new V16 had all the character of a fallen cake. Although Cadillac’s new sixteen lacked the styling and grace of its predecessor, it propelled the model line successfully through the end of the decade and the end of an era in American automotive history. The Cadillac V16 Aero-Dynamic Coupe was a daring departure from conventional styling in 1933 when it appeared in the GM exhibit at the Chicago Century of Progress Exposition. Between 1934 and 1937 Cadillac produced at total of 20 Aero-Dynamic Coupes, eight of which were on the V16 long wheelbase, 154-inch chassis. The remaining cars were built on V12 and V8 chassis. This example from the Nethercutt Collection was the only V16 Aero-Dynamic Coupe built in 1937, the last year of production for the original V16 engine. The car sold for $8,150.